Bourbon Butternut Squash Risotto, huh? Isn’t risotto Italian? Isn’t Bourbon…deep south? Well, yes on both counts. But that doesn’t mean they cannot be amazing together. I thought of this combination when I decided that we were going to have Butternut Squash Risotto the other night. That much was certain. We grew butternut squash last summer and have been getting them weekly in our CSA. I try to keep up, but I think we have about 10 butternut squash in our garage right now. They must be used up! We also had arborio rice in the pantry that was just waiting to be made into risotto. And being the beginning of the year, I’m newly motivated to clean out our pantry, use up stuff that has been in there too long, etc. As I gathered my ingredients I realized that we didn’t have ANY white wine in the house (not even a bottle of 2 buck chuck chardonnay). It was cold, rainy, 5pm. All factors to make me not want to leave the house with my toddler to buy a $2 bottle of wine. I wondered if risotto could be made with any other kind of alcohol and immediately thought bourbon would be pretty tasty with butternut squash. I did a quick google search and found out that I wasn’t the first to think of this (dangit…you mean this isn’t an original idea?!). Then I texted my foodie friend to make sure I wasn’t crazy. He approved of the experiment and off I went a-cookin’. The end result was delicious. Probably the best risotto I’ve ever made. I highly suggest you try it if you have some extra butternut squash laying around. 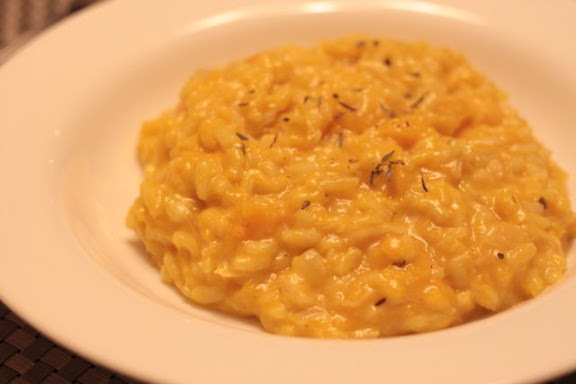 And if you don’t want to use bourbon, I’m sure it would be very delicious regular butternut squash risotto without (or with the more traditional white wine)…this was just a very fun twist. 1/2 cup bourbon (note: most risotto recipes call for 1 cup of white wine. I reduced it to 1/2 cup of bourbon…figured a cup of bourbon would be a bit much). 1. Preheat the oven to 400 degrees F. Cut the butternut squash in half. Remove the seeds. Lightly coat a baking dish with olive oil and place the butternut squash face down on the baking dish. Bake for 45 minutes, until a sharp knife pierces and goes into the squash easily. 3. In a separate pot, pour all 6 cups of chicken broth. Heat broth until it begins to simmer. Then turn down so that it stays hot, but doesn’t boil. 4. Add butter to the onions and allow it to melt. 5. Add arborio rice and stir to coat the rice with butter. Stir continuously until the outside of rice grains start to become translucent. The inside will stay white. 6. Add bourbon. Stir until bourbon cooks down to about half. Start to slowly add hot broth, one ladle-full at a time. Make sure to stir fairly continuously, but especially right after each ladle of broth goes into the rice. 7. Continue until you have no more broth. If you’re not serving immediately, save one ladle of broth to add right at the end. 8. Scoop butternut squash out from skin and roughly chop. Mix into the risotto. 9. Mix in creme fraiche and parmesan cheese. If you’ve reserved a ladle-full of broth, add it now. Crush the dried thyme over the risotto with your fingers. This entry was posted in Food, Risotto and tagged Fall, Recipe, Risotto, Winter, Winter Squash on January 7, 2013 by seedsowingmama.